Both male and female African elephants grow tusks – the largest upper incisors on this planet. Their tusks grow every which way: up and curved, or down and straight, up and straight, or down and curved – the variations are endless. Some tusks are thin; others fat. Some are short and puny; others long and magnificent. All elephants have only two types of teeth – tusks and molars. Four molars, two above and two below, are present throughout an elephant’s life. 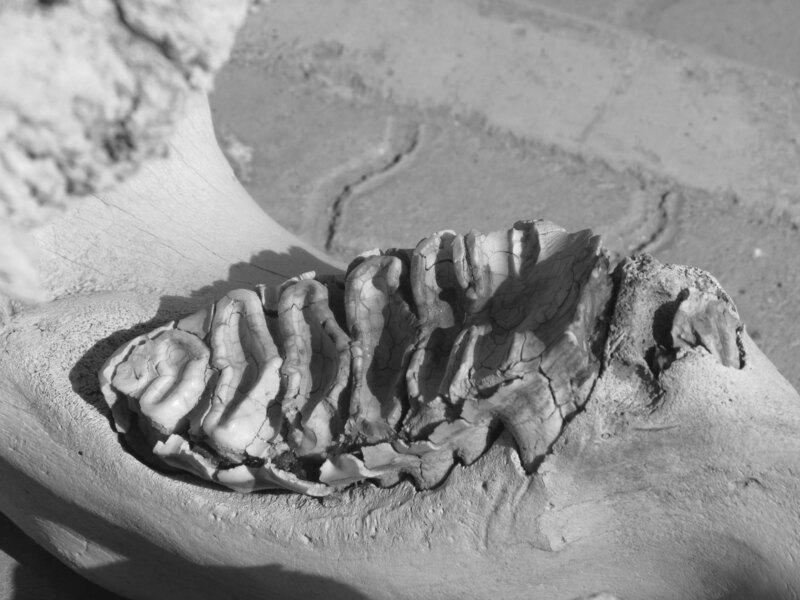 An elephant’s molars look like dishes set to dry edgewise on a rack, bonded together by enamel. Vertical ridges in each molar function like giant vegetable graters as the elephants move their jaws forward and back, rather than side-to-side like a cow. Molars grow up to a foot long, with a maximum of ten ridges, and weight eleven pounds apiece – perfect for grinding up trees. They push forward throughout an elephant’s life, becoming part of a conveyer belt of teeth. Fragments of molars crumble off in pieces as they wear down near the front of the mouth and either fall out or are swallowed. Throughout an elephant’s lifetime, twenty-four molars in six sets will grow in their mouths, but just two tusks. Only ten percent of aging elephants grow a seventh set of molars.